I was recently invited to a friend’s birthday lunch. She gave me strict instructions not to buy her a present, so I didn’t, I made her these instead, which I packaged into a white card cake box. Baked goods are always acceptable as a gift, even if you’re not supposed to bring a gift! 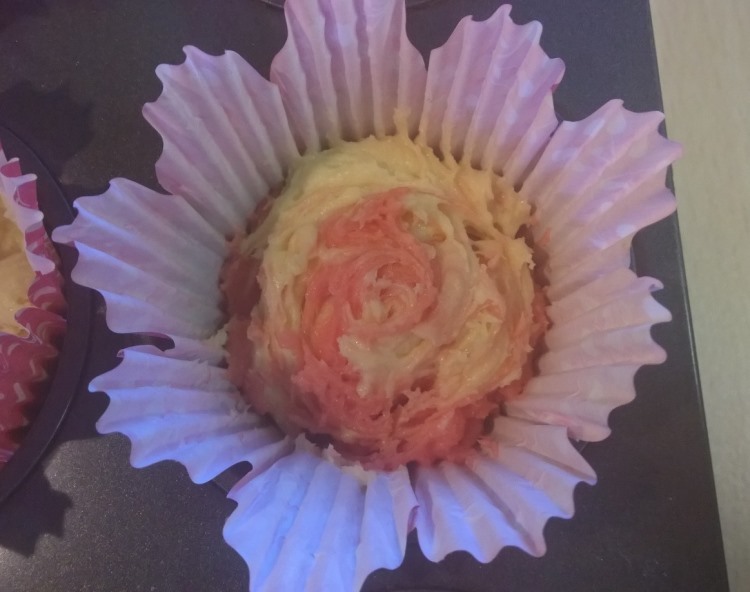 They are flavoured with rose extract so they taste like roses as well. My daughter said these look more like cakes for a child’s Disney princess party than for an adult, I think she’s right, but that’s ok, adults might want to feel like a princess on their birthday too, right? This will make 12 cakes, despite there only being 9 in my picture – the cake box only had space for 9. – Buttercream: 250g softened butter, 500g icing/confectioners sugar, 1 tsp vanilla essence. 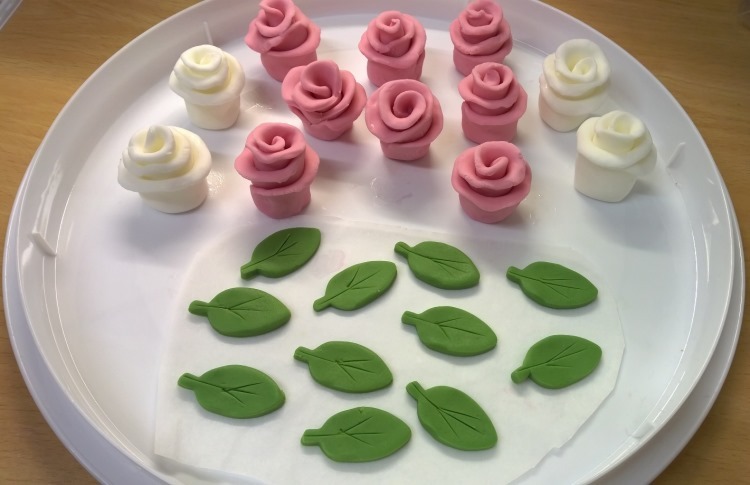 – Roses and leaves: Ready made fondant/ready-to-roll icing and colouring (or make your own fondant by kneading 500g icing/confectioners sugar with 1 egg white or equivalent amount reconstituted egg white powder, and 2 tablespoons liquid glucose). 1. Sift the flour into a mixing bowl, add the rest of the cake ingredients, apart from the red colouring, mix on slow speed until it is all bound together and then beat on high speed for about a minute until smooth and creamy. 2. Split the cake mixture in half, and add a few drops of red colouring to one half and mix well, you’re aiming for a fairly deep pink colour, so add more red if needed. 3. Place 12 large cup cake cases/muffin cases into pans, and into each one place a blob of the pale cake mixture, and a blob of the pink. Add more blobs as needed until you’ve used up all the cake mixture. Using something pointy, roughly swirl the cake mixtures together in each paper case. 4. Bake in a preheated oven 150C/300F for about 25 mins until they spring back when gently pressed. Cool them on a rack. 5. To make the buttercream, sift the icing/confectioners sugar onto the butter and beat well until fluffy. Add the vanilla and mix in well. If it still seems too stiff you can add a little milk. 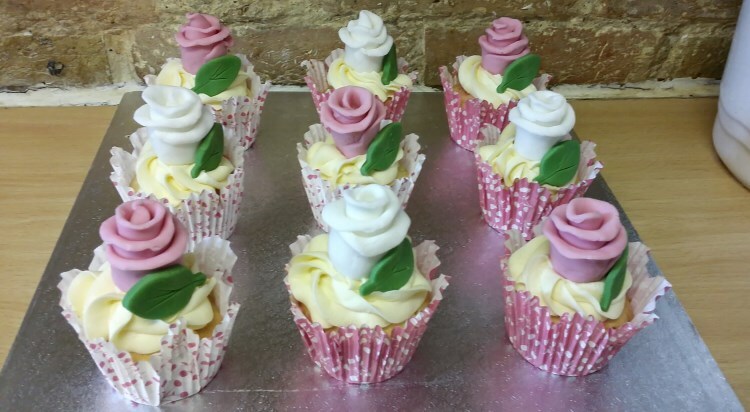 Using a large piping nozzle, pipe a big swirl on the top of each of your completely cooled cupcakes. You probably won’t need all the buttercream, depends how thick you like it. 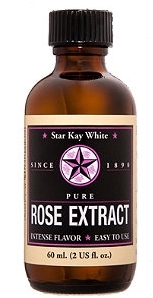 …then pinch the rose together a little at the ridge end, and on the other end carefully open out the swirl to look more like petals. 7. To make the leaves, knead some green food colouring into fondant, roll it out thinly, cut some leaf shapes with a cutter, or a knife, then use the tip of a sharp knife to draw veins on the leaves. NOTE: You can make the roses and leaves several days ahead of time and store them in an airtight tub until you’re ready to use them. If you line the tub with greaseproof paper it will stop them sticking. 8. 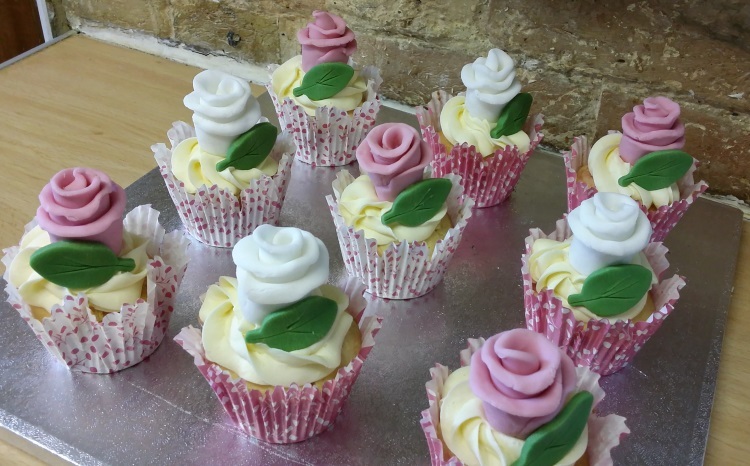 Gently push the roses and leaves into the swirl of buttercream on the top of each cake. And you’re done! Yes, she did appreciate them, who needs to buy gifts when you can bake gifts instead right? These are so beautiful Vanessa! What a thoughtful gift. You are officially invited to attend my next birthday. …. DO NOT bring a present….. a few cup cakes are acceptable. .. like two dozen ?…. I’m not a pig. ..but bulldogs eat a lot. …. Thank you Tess. I’ve been getting more arty with my bakes lately haven’t I! Well that’s the beauty of photographs, you can eat them but still keep them visually intact in the picture! 😀 😀 😀 I like your sense of humor. Beautifully presented little cakes, Vaness-Jane. Stunning, and certain to appeal to the princess in every woman! Thanks Christine! We all have a bit of princess in us right? Wonderful cakes, these would be great for Easter! Ooh, good thinking, yes, Easter! 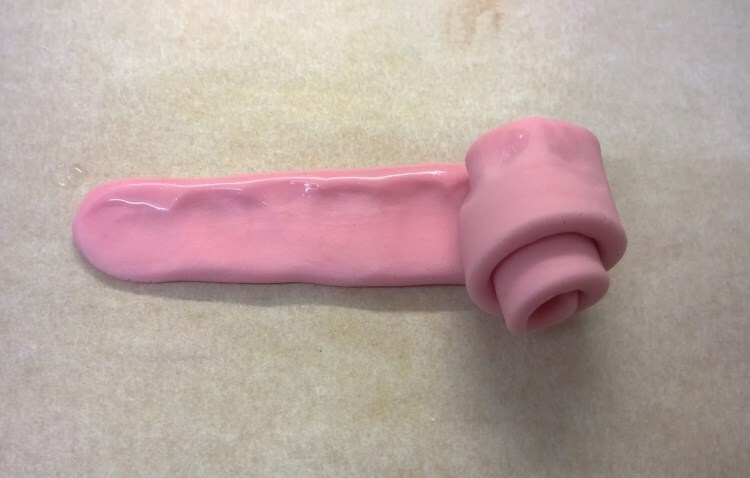 Maybe for someone less girly, we could make dark blue and black roses rather that pink and white – that might look quite cool actually! I’m no princess but they were good! Ok, ok, I’ll get back in the kitchen!